I have slacked off on documenting my Dressember entries online, however, I’m happy to report that I have not slacked on wearing dresses, nor taking photos to prove it! I had thought I’d posted more recently than… the 20th?! Sheesh. So here is a round-up of one full week of holiday dresses. Dec. 20th – Neko’s birthday, and a work day for me. 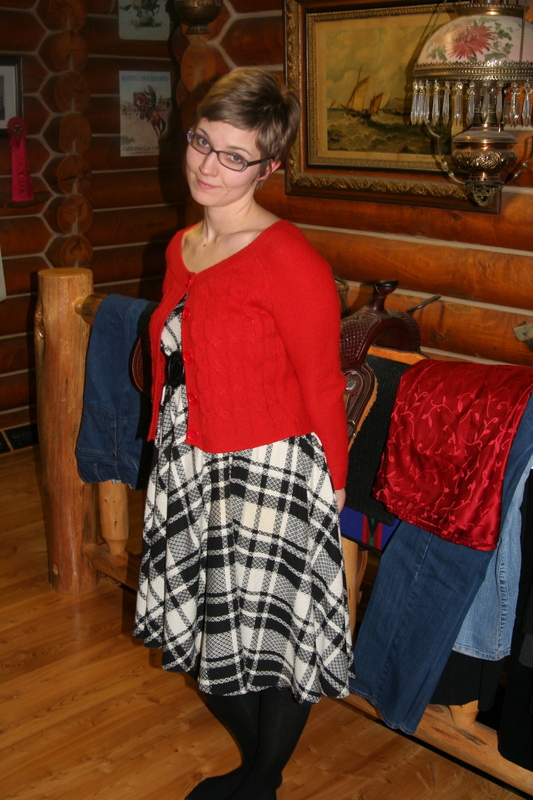 We had a Solstice party that night, but I changed out of the dress for that. 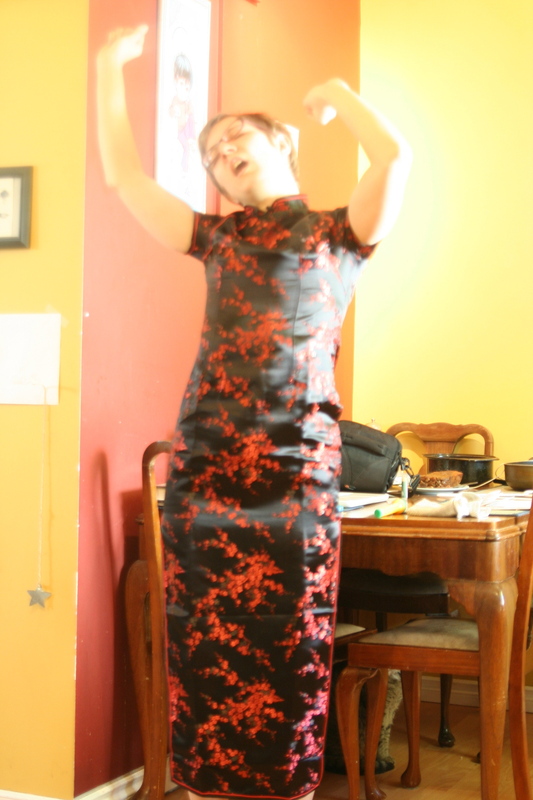 Years and years ago, I picked this dress up at Value Village. 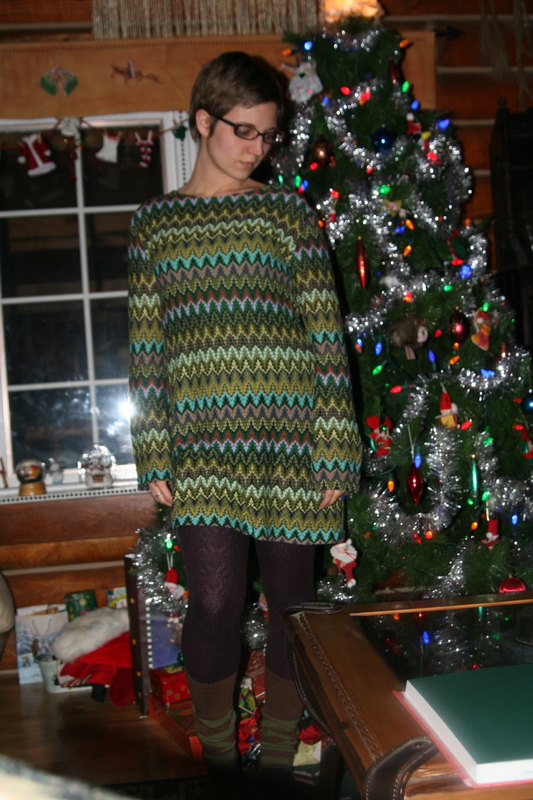 It was too big for me, so I never wore it, but I love the eyelet pattern and held onto it. This was the first time I had worn in. I was sad to discover that the neck is tight and coarse. Dec. 21st – Solstice! I wore something fancy and fun. Why not?! Dec. 22 – We had pyjama day as a theme day for the kids. Ate breakfast for lunch, stayed in our jammies all day. I wore flannel most of the day, but changed into this piece long enough to take a photo. Dec. 23: My last day of work before the holidays. After work we traveled up to my parents’ place. 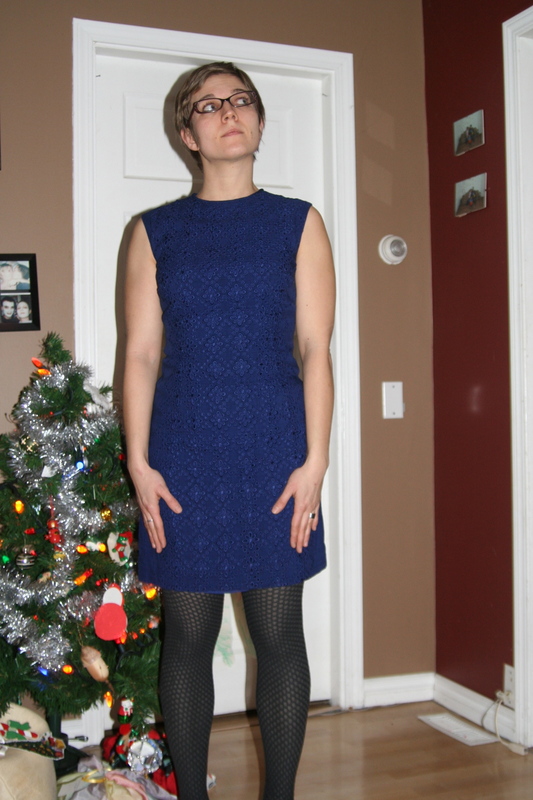 This dress is an all-time favourite; I bought it at Value Village when I worked there 12 years ago and still love it. Dec. 24: Christmas Eve, of course! I put on a light dress for lounging in the loft by the fire. Lovely. Dec. 25: saved a simple favourite for Christmas day. Dec. 26: A third Christmas celebration, with my mom’s extended family. This is a skirt from Value Village that my wonderful best friend, Nicole, suggested I pull up above my chest and then belt and throw a cardigan over. 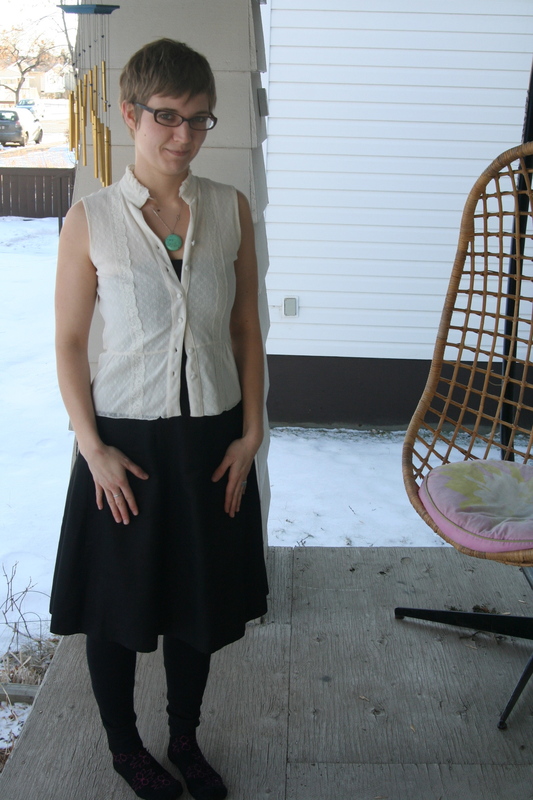 Actually, I bought the skirt, cardigan and belt all in the same Value Village trip. 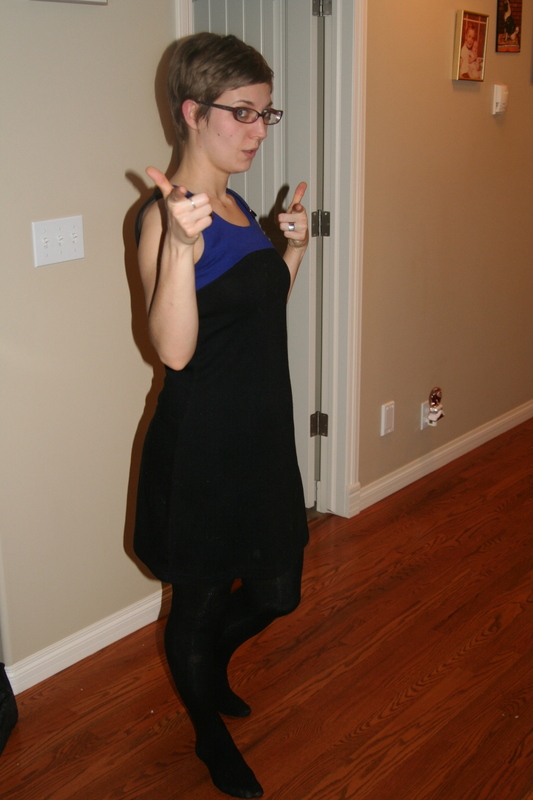 Dec. 27: Another night spent lounging in the loft by the fire; thus allowing for a summery dress. Wish I had pulled the belt to a reasonable spot before this photo! Ah, well. *Note: We didn’t kill that elk. It’s a hand-me-down taxidermy. We’re not hunters, especially not trophy hunters. Also, I didn’t mean to pose in front of it but I have to say it’s a bit funny.